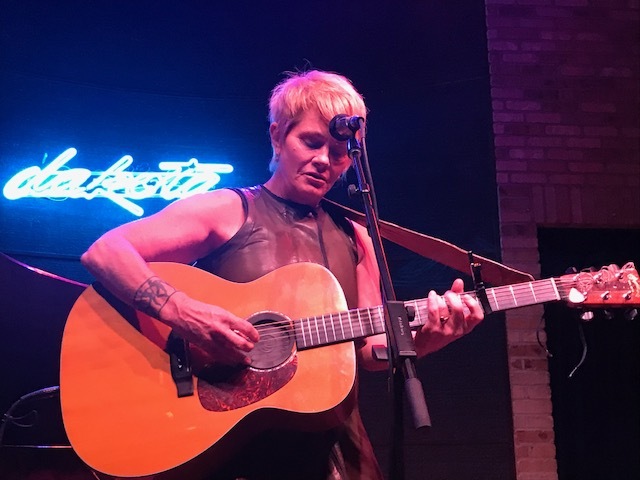 This is an entirely personal note on Shawn Colvin’s residence concluding last night at the Dakota Jazz Club. I did not intend to return to the subject after my post last week. These comments are prompted by the fact that I can’t find any reviews of Shawn’s shows in Minneapolis online this time around. This is for the record! The Star Tribune’s Jon Bream overlooked Shawn this week in favor of Liz Phair and Paul Simon. However, Jon caught her on one of her three nights here in 2016 and rightly raved about the show he saw. I was there too. I thought his close observations got it exactly right. Last week I mentioned that we bought tickets to each of Shawn’s four shows. I had seen each of her shows over three nights in 2016 and was blown away by the intimacy and variety of the shows. If you wanted to see the artist in full, you had to be there each night. The same was true this year. We bought the tickets as soon as the shows were announced. I must have been the first in line because we had seats right in front of Shawn every night. I snapped the photo of Shawn from our table last night. Seeing her up so close added greatly to the experience. When Shawn came out onstage to perform on Wednesday evening, she looked down and took a deep breath before she went to work. It was something real. Shawn, incidentally, had opened her Wednesday night show (the first) with Simon’s “An American Tune.” Paul Simon wasn’t far from her mind either, but it was the only one of the three shows we saw in which she played the song. You had to be there. At the Paul Simon show on Friday night I followed Simon’s set list online from his previous shows on this tour. Backed essentially by two bands — the musicianship was outstanding — he had no room for improvisation. The show struck me as mechanical. I thought the sound was tinny. I was bored by several of the selections he made to review his career. Same set, same encores. I thought to myself that I’m done with arena concerts, though I’m sure that’s one of the vows I’ll never keep, as Shawn puts it in “Polaroids” (a highlight on Wednesday, Friday and Saturday with her hilarious illustration of how she borrowed two chords from “Put a Little Love in Your Heart” to write the song). Sitting where we were, we could read her set list on the stool with her capo and picks. She had three songs listed for her encore last night. The last one was “?.” It turned out to be Shawn’s interpretation of Bob Dylan’s “You’re Gonna Make Me Lonesome When You Go.” I love what she does with this song. Warm, funny, remorseful, tender — she brings it all out. “You’re gonna make me give myself a good talking to,” indeed. In her shows Wednesday and Thursday, the last number of her encore turned out to be David Byrne’s “This Must Be The Place” (closing line: “Good night”). On Thursday night someone behind us called out a request for “Salome.” Now I am obviously a Shawn fanatic, but I had never even heard of “Back to Salome,” written for the film Tin Cup. She responded immediately, even though she was a little rusty on it. She played a couple of verses before giving it up. Shawn is an artist who has transformed a lot of pain into beauty without losing the feeling along the way. I am grateful to have been able to catch her again this time around. I hope you will get the chance to see her live and enjoy the show as much as I did if you do.